The Nintendo Entertainment System inspired Raspberry Pi case was designed to relive childhood memories. This unique design is made out of durable plastic and was designed to fit perfectly on the Raspberry Pi 3,2 and B+. 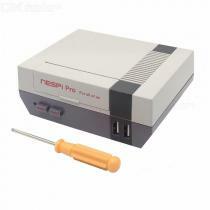 The NES case provides access to every outlet of the Raspberry Pi without opening the case. The air vents provide good ventilation while in use. This firm design, made out of plastic is held together, ease to install. Inspired by the Nintendo Entertainment System.